How important is worship? Do we need to perform the elaborate rites and rituals we were taught when we were young? It was the day before Varalakshmi Puja and our members were concerned. 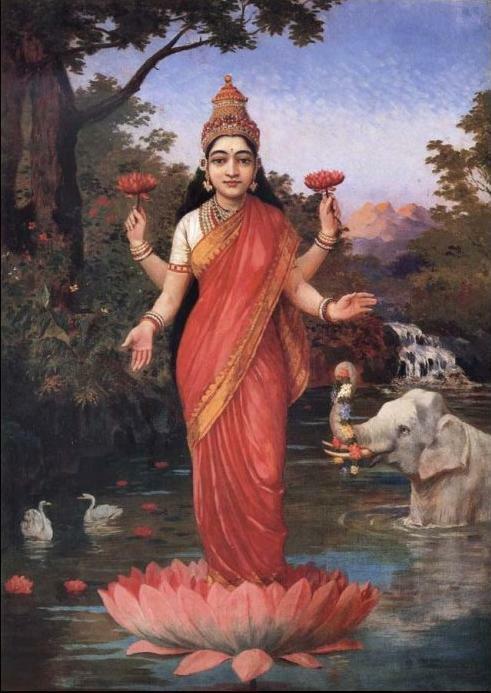 Varalakshmi Puja is the worship of Laxmi, the goddess of wealth and prosperity. It is performed by married women and is meant to benefit our husbands and bring them good fortune. Like most pujas, it demands preparation. The house needs to be spotlessly clean, floors mopped, counters scrubbed. There are materials to gather, flowers, coconuts, fruits, nuts, ingredients for the prasad or food offering that must be cooked on the day of the puja after bathing. Hair must be washed, silver must be polished, there’s decorating to do and all this takes time and effort. This is the way we were taught growing up, how our families celebrated festivals when we were young, with lots of preparation, lots of hustle and bustle, lots of sweets to eat and guests to entertain. And now, even though we are thousands of miles from our childhood homes, we seek to recreate that festive tradition for ourselves and our children, and feel tremendously guilty when our efforts don’t quite match up. We remind ourselves that our parents and their parents had a vast network, a support system of family, relatives, servants, who made things happen. We bemoan the fact that we are on our own, often holding a full time job outside the home, and that multiple responsibilities are constantly demanding our attention. And so, as happened last night in our group, the act of worship becomes almost burdensome, a duty that needs to be fulfilled for fear of a guilty conscience. It seems to me that far from being a dreaded obligation, worship and its attending rituals should be a divine pleasure, to be indulged in not to please either God or the world, but to provide us with a period of deep and intimate connection with our inner source. When I perform the Varalakshmi Vratam, which I do each year, I imagine it as a special date with my inner Goddess. The morning begins with sweeping and mopping the floors, which I visualize as sweeping aside all the foolish thoughts and desires that usually run rampant in my head. Then I bathe and wash my hair, a further outer cleansing to prepare the mind to be clear and still. I take the carved silver bowl set aside for that purpose and go into the garden to pick flowers. There is something immensely tranquil about the act of picking flowers for worship. Red hibiscus, bright yellow marigolds, purple clematis, white roses vying for my attention from the waving branches, asking to be picked for this special honor. Then I clean the puja room, wiping each framed portrait, each silver figure until they sparkle. I put fresh sandalwood and kumkum on each. I light the incense to purify the air. I light the oil lamp to awaken my dormant spirit. I lovingly wash the coconut I have picked out ahead of time, shaking it to be sure it is filled with water, and making sure it is perfectly proportioned, with an oval shape. I mix turmeric with water and cover my coconut in the yellow paste. Then I draw on the eyebrows, the eyes, I shape the nose from wet turmeric paste, I draw on the rosebud lips. I place the coconut on top of the silver pot or kalasha. Then I decorate the beautiful face with my jewelry, earrings, a necklace, a large round bottu. Finally I drape a sari around the pot and the coconut, creating a lovely goddess all my own. I invoke the Universal Spirit to enter this form and accept my tribute. I chant the mantras and perform the puja, ringing the bell and offering the flame during arati. With each flower and rice grain I toss, I offer up my ego and ask for liberation. When I am done, I lay out freshly prepared tamarind rice and curd rice as my final offering. Yes, it’s a lot of work. It takes up my entire morning. But it gives me tremendous pleasure. For the entire time, I am immersed in my love of the goddess, my inner atma finding refuge in the infinite Atman. Each act is an offering, a cleansing and a tribute. There is no room for any other thought and so my mind becomes one pointed, focused, at peace. The point of Hindu worship it seems to me is to attain that one pointed focus. Whether we perform rituals or sit in deep silent meditation, whether we indulge in charitable acts or we imbibe knowledge, we are seeking peace and harmony. In the Gita this week, we read that a peaceful mind is the precursor to happiness. So while it may seem sometimes in the frenzy of daily activity that the rituals we grew up with are a burden, they are in fact the opposite. There are no repurcussions for not performing them if we are pressed for time. They are by no means required or obligatory, for surely God can do just fine without our paltry offerings. Instead, like many practices in Hindu tradition, they are there for the specific purpose of purifying the mind. By keeping us focused and absorbed in God consciousness, worship, if we can make the time for it, becomes a shortcut to the peace we all long so desperately to attain. This entry was posted in Uncategorized and tagged gita, hinduism, india, indian women, lakshmi, laxmi, puja, spirituality, varalakshmi, women, worship. Bookmark the permalink. Thank you, Kamal. I agree with your very wise teacher. If we can put our whole heart into the details of any act then we are actually already in meditation.